Seven dancers, strong, sensuous and scintillating, together draw from their own traditions under the focus of a kaleidoscope of light and shade to construct a mosaic of movement. 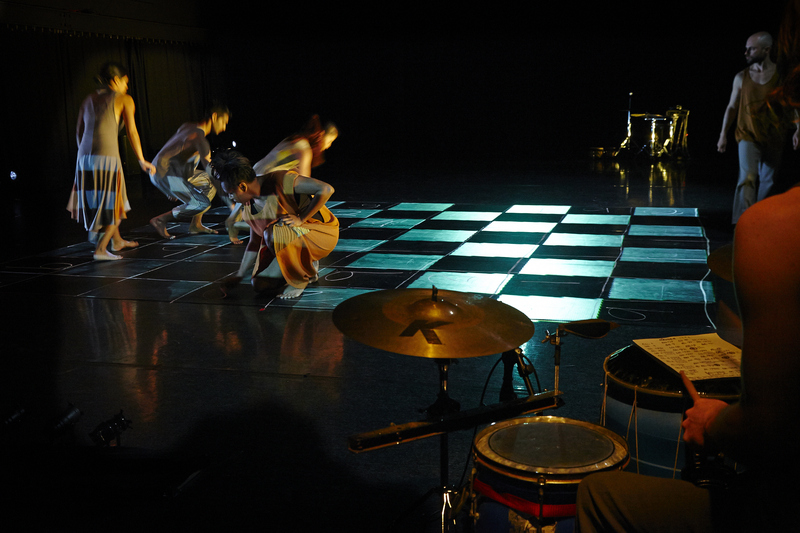 This is the exciting and newly developed work of Annalouise Paul, Choreographer and Director of Mother Tongue. Annalouise Paul is the Receiver of Australian Arts in Asia Award and Premier’s NSW Export Award winner 2013. 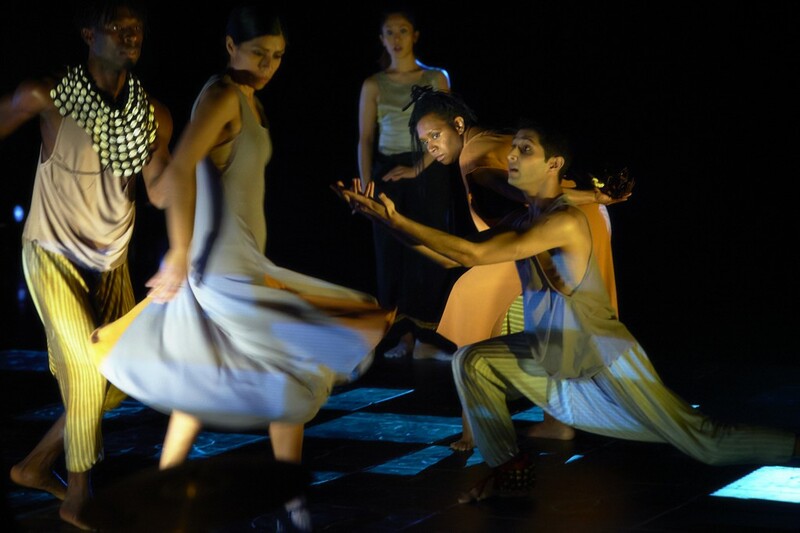 Mother Tongue is the third and final work in a trilogy of dance – theatre conceptualised over 7 years ago says Annalouise Paul. Mother Tongue challenges the viewer by presenting the familiar within an unfamiliar landscape of light, rhythm and music showing the convergence of many cultures upon our soil. The interaction between the traditional and modern, the games we play in a game of chess, in rhythm and posture, through success and defeat, chaos and unity. It purposely leaves the viewer without a resolution providing little closure. Perhaps this truly represents the fact that when 7 young artists are thrown together from different worlds, it is less about achieving any resolution as each has to compete to survive. Andrea Adidi trained at the National Aboriginal & Islander Skills Development Association successfully weaves through the performance unaffected by the trials and tribulations of others around her. Her style threads the differing forms of dances together into a beautiful garment of choreography. As she spins and turns much like the earth around the sun. She can be perceived as the remaining one, unifying all, the ever present. Geraldine Balcazar, a Chilean movement artist brings the fiery touch of her flamenco steps in contrast to Aletta Fauzi trained from Jakarta Arts Institute whose ever graceful movements extol the east. Bringing a smile, the joyful african routines of Patrick ‘Lucky’ Lartey’s from Ghana glistens in conversation with the beautiful and yet complex rhythmic vocal percussion and modern interpretation of Bharathanatyam by Govind Pillai, Australian born Bharathanatyam dancer from Melbourne. Brazilian dancer Gregory Lorenzutti’s acrobatic feet, hand and torso challenge and coaxes others in a parallel conversation. The show was ably supported by tabla player and vocal percussionist Tim Foley and Paschal Daantos Berry, writer and dramaturg. The lighting engineer Toby K for his creative lighting effects and Tobhiyah Stone Feller for stage design. The art design used in the multimedia is credited to UK based Indian artist Saranjit Birdi. Above all, Mother Tongue extends the boundaries of dance traditions in an ever changing dialogue, refusing to conform, yet gaining strength from and redefining them.